Join us on an epic half day adventure and explore some of the most spectacular canyons in the world. Rated the best tour in Dominica and among the top things to do in the Caribbean. Dominica is home to some of the most spectacular canyons in the world. Rainfall over thousands of years carved out deep gorges in the rock creating an ever-changing landscape of rivers, waterfalls and pools hidden in the rainforest. Explore this geological wonder on an epic half day family fun and bucket list adventure. This epic excursion will call for swimwear, a towel and closed footwear of your own, and your guides will take care of the rest. After getting geared up at Extreme Dominica’s headquarters you will learn how to rappel on a 8-foot training wall and receive a briefing before you go on a 15 minute drive to the canyon where the real adventure begins. After traversing the magical canyon the tour concludes with a 15 minute hike back to the vehicle. The tour ends at the canyoning school with hot cocoa tea and fresh local fruit. Your safety is our main priority during a Canyoning Experience. All our canyoning leaders have years of experience and are trained according American Canyoning Association standards. When rappelling or abseiling in the canyon we use this 3-way safety system to keep you safe at all times. During a rappel you will control your own speed. You will learn this easy skill during the brief training at the start of the experience. This extra safety line is attached to your harness and controlled by the canyoning leader at the top of the rappel. The canyoning leader at the bottom of the rappel called the "fireman" is holding and guiding your rappel line as extra safety. 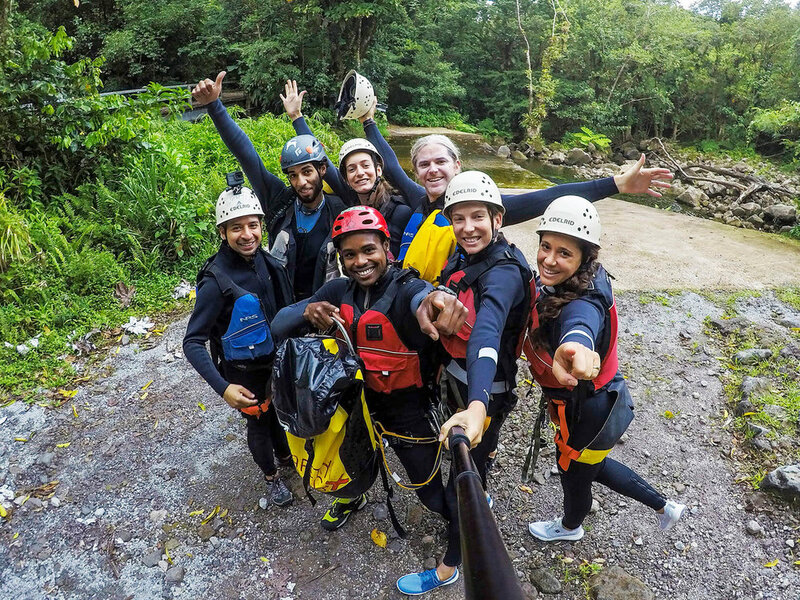 Book your Canyoning Experience or Join a Group to start! If you want more after this adventure you can try Night Canyoning or Advanced Canyoning and explore canyons traversed by the very few. 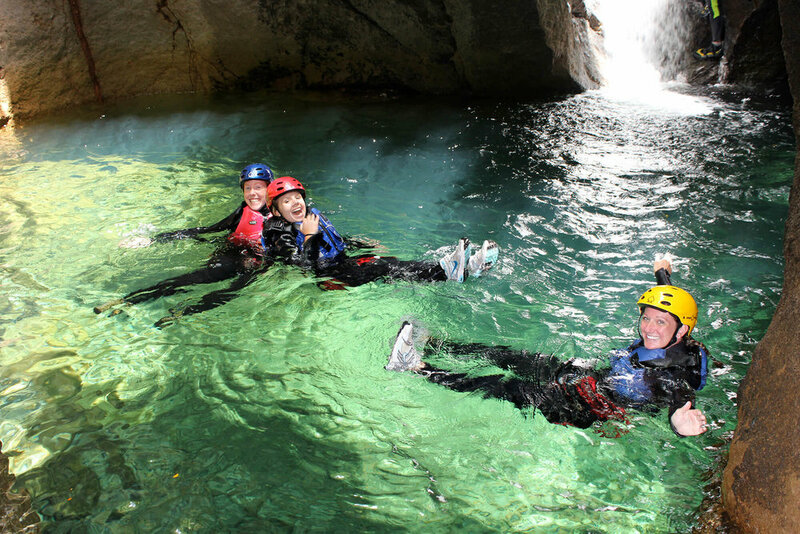 We also offer multiple days of canyoning for adventurers with no experience as well as for the expert canyoneer. * Rates (USD) p.p. include gear, taxes and transportation from Roseau. * Canyoning is weather dependent and may be cancelled last minute. Canyoning leaders equipped with full HD camera’s will capture all the exciting moments of your adventure from a different angle. Surprise your friends or family with the Anniversary Special and celebrate together in the canyon. Imagine being together on a rappel in the middle of the rainforest proposing to the one you love. * Rates (USD) include taxes. 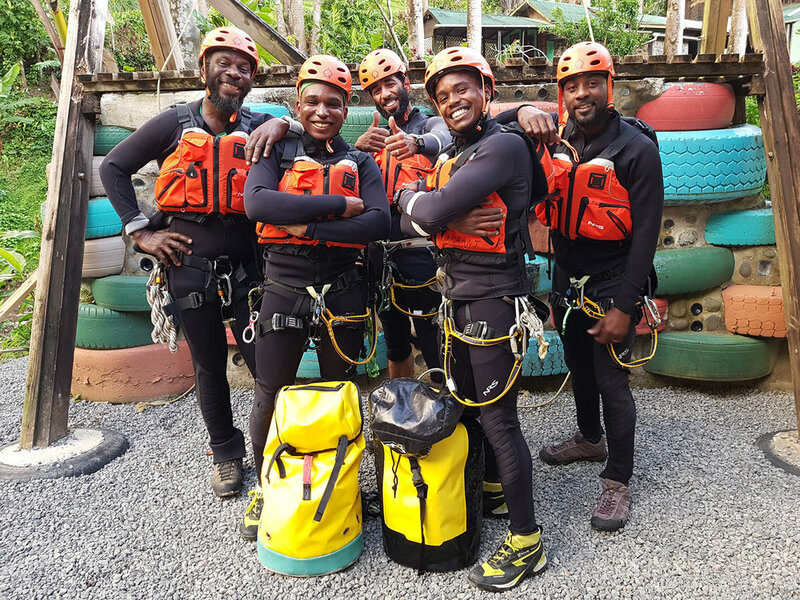 Meet the Extreme Dominica team, a group of expert canyoneers that have years of experience and are ready to tour you through the canyons of Dominica. 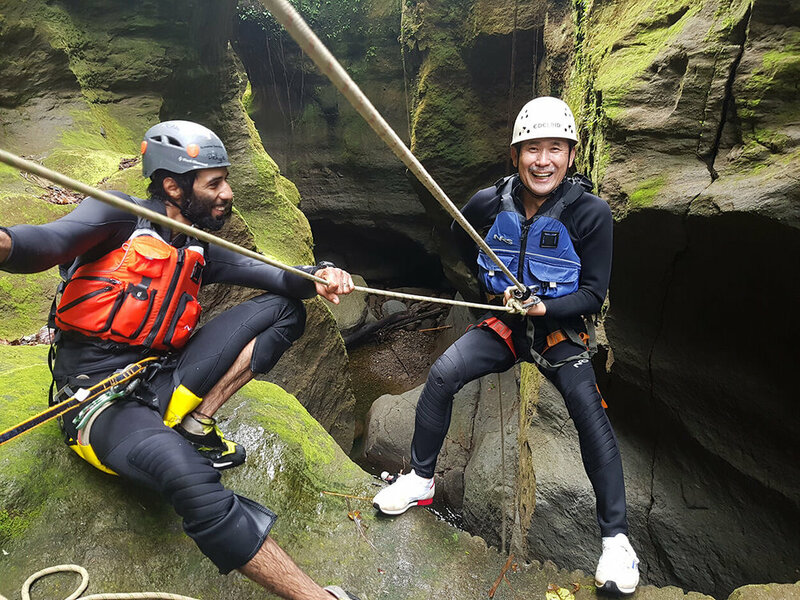 Journey with these experienced canyoneers to explore the secrets of the Nature Island, where you will find sights you have only dreamt of. We will take you where no one else goes!